Possibly the best mobile chess game ever ... now available for Square screens too ! Various levels, boards and chess sets combine with an impressive chess engine to offer you an ever increasing challenge. Whether you're just starting out or else a seasoned pro, Mastersoft Chess has something for you ! Take back a move if you change your mind ! Opening Book of over 23000 moves ! 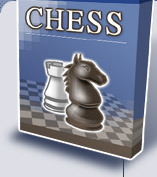 Full Chess rules including enpassant, castling etc. Boards constructed from the real thing - Oak, Ash, Marble, Slate and 5 more !